She doesn’t have a star on Hollywood’s Walk of Fame, but she should. Dolly Sadell has contributed as much to the arts as many on that walkway. She has written, produced and directed more than fifteen different musical revues. Not just on film or the big stage. She has created them for country clubs, community fundraisers, church events, etc. “When I was a little girl I’d go out with my mother. She would play the piano and I would sing and dance for children’s homes, elderly homes and hospitals throughout Philadelphia,” says Sadell. Ask Dolly if she was destined to be in the arts and she’ll laugh and tell you how her parents met, “Mother…was playing a classical piece on the piano and my father walked by her window, heard the piece and knew it. He pulled out his violin and started playing with her so they played music together before they ever even saw each other. And when they met, that was it.” Sadell, herself, began her show biz training at a tender age. She was enrolled in ballet, tap dance and gymnastics from the time she was four-years-old, until her father became seriously ill when she was13. Sadell also helped put on several fundraisers for the playhouse that included BBQ’s and fashion shows. “We did a cocktail party that featured Tex Beneke who had taken over Glenn Miller’s Orchestra when [Miller] died, and he was the greatest gentleman. 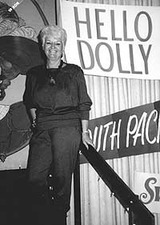 It was a tremendous success.” Dolly also helped coordinate another cocktail party with Alice Netzen where everyone dressed up as their favorite character. Benefactors showed up dressed as such varied talents as Mae West and Miss Piggy. The playhouse was so appreciative of the effort and result that they sent Sadell and Netzen on a cruise. her father’s books. Then she partnered with her husband, Walter, for many years in their business. 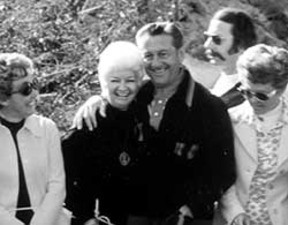 The couple moved to San Clemente in 1975 when Dolly’s husband began having health problems. They merged their business with a major company and retired. When asked about all the changes she has seen in her 28 years as a resident in San Clemente, she recounts how all the hills were barren of houses. “ But I have so many friends on those hills now, I am glad to see all those homes,” she quickly remarks. In spite of her long list of accomplishments in the arts and business, when asked about her highest achievement, Sadell immediately exclaims, “My family! They have always shown me a lot of love and respect and never caused me any problems or trouble.” Her children, grandchildren and now a great-grandchild have, “all been a tremendous blessing.” In fact, Dolly was leaving for two weeks in Italy with her granddaughter, who just graduated from high school, when this reporter caught up with her for this interview. None of her family lives locally and they have asked her to move closer to them. She says she is “just not ready” to leave friends and her home across the street from the ocean to go live with them. At the end of this interview, after reminiscing about all the special moments over her lifetime, Dolly Sadell smiled and stated, “I like to make things happen.” And make them happen she does.